Today the reality is more integrated, dynamic and fast changing compared to just a few years ago. This also effects how to rapidity be able to build large and complex solutions that fits organizations and their customers. That means that the time to realize an idea to an implemented function is short. Therefor must large solutions be divided into smaller delivery portions so that addressed users gets the requested benefits before their reality changes again and may change wanted demands. When realizing a solution, which is supposed to enable new possibilities or benefits in an efficient way, the early stages in the realizing phase is important. Going from an unclear idea to more clear high-level requirements it is important that needed stakeholders are involved and must contribute with their knowledge and see needed changes to processes and standards that may come with a new function. All stakeholders must be aware of a coming change realized via a system change due to new demands from customers. Customer demands are changing fast and as a provider of a function, you need to maintain and adapt the functions in the same speed. When high-level requirements are specified they must be detailed into smaller bits and pieces and then prioritized. Prioritized and approved requirements must then be gathered as working packages for implementations. Establish a whole function is made in iterations where each iteration includes elaboration, construction, evaluation and maintenance phases. In the beginning the iterations enables involved teams to focus on important tasks first and later on, the iterations enables great possibilities to rapidly offer targeted user groups new great features in smaller pieces. To be successful with a project to enable a new or enhanced function, it is important to specify and agree upon stated requirements - it’s important to not lose the initial intentions of “why“ during the specification of “what”. 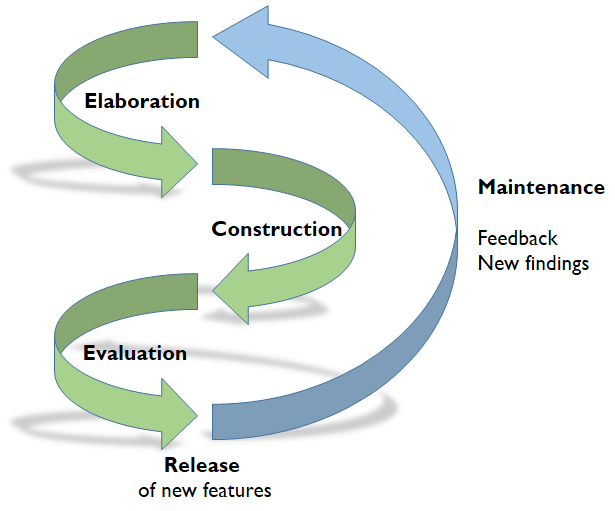 Requirements needs to be elicited during whole project due to reality change or new effecting findings.